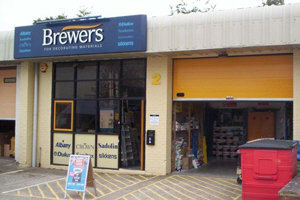 Trade and retail customers have been coming to these premises for more than 25 years now, since we were known as Wilson Meade, before joining the growing Brewers family. Now a Brewers Decorating Centre, our team of four has more than a quarter of a century of product expertise under their decorating belts. We supply a good range of trade and designer paints and offer the largest choice of wallpaper books in the Andover area. We’re on Hunting Gate, on the Portway East Business Park. It’s all of a couple of minutes’ drive from the A303 and five minutes from the town centre, via Weyhill Road. Once you’re on Portway East, look out for the signs and entrance alongside Screwfix. We’re dead ahead and there’s customer parking right outside.